The Russian Supreme Court outlaws a number of Islamic organizations. The “black list” of groups, compiled by the Russian Federal Security Service (FSB), includes Asbat al-Ansar, a Sunni militant group based in Lebanon. [Interfax, 3/15/2007] In late 2006, the US will begin providing funds through the Lebanese government to this and other militant Sunni groups as part of an effort to rollback the influence of Iran and the Shiites in Iraq (see Late 2006). The militant Sunni group, Asbat al-Ansar, begins sending fighters to Iraq. The group is based in a Palestinian refugee camp in Lebanon. A deputy commander of the group later tells the New York Times, “The US is oppressing a lot of people. They are killing a lot of innocents, but one day they are getting paid back.” [New York Times, 3/16/2007] The Bush administration, which has repeatedly called Iraq the new front in the war on terrorism, will reportedly begin funneling funds through the Lebanese government to Asbat al-Ansar and other militant Sunni groups in late 2006 and early 2007 in an effort to rollback the influence of Iran and the Shiites in Iraq (see Late 2006). Contradicting Previous Assertions - In announcing the surge, Bush contradicts the position he has asserted since the March 2003 invasion—that military commanders were determining the direction of the war effort. Bush has repeatedly spoken of his disdain for micromanaging the war effort, and has said that he won’t second-guess his commanders. “It’s important to trust the judgment of the military when they’re making military plans,” he said in December 2006. 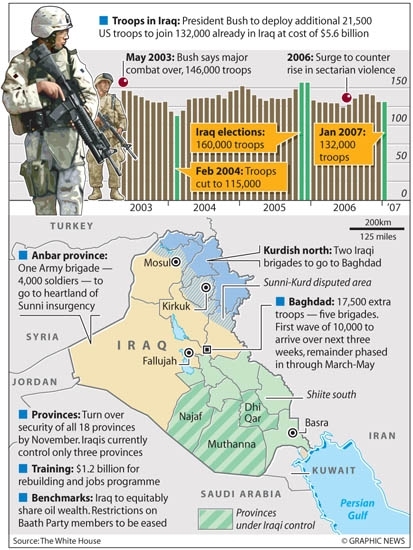 “I’m a strict adherer to the command structure.” However, Bush balked at following the advice of many top military officials and generals, who have recommended a gradual drawdown in troop strengths, and in recent weeks replaced several top military officials who expressed doubts about the need or efficacy of new troop deployments in Iraq (see January 5, 2007). Instead, Bush believes the escalation will alleviate the drastically deteriorating security situation in Iraq. According to Pentagon officials, the Joint Chiefs of Staff, who oppose the surge, have agreed to support it only grudgingly, and only because Bush officials have promised a renewed diplomatic and political effort to go along with the escalation. Outgoing Central Command chief General John Abizaid said in November that further troop increases were not a viable answer to the Iraq situation, and in their November 30 meeting, Iraqi prime minister Nouri al-Maliki did not ask Bush for more troops, instead indicating that he wanted Iraqi troops to take a higher profile. Viewpoints differ on Bush’s interaction with his commanders up to this point—some have seen him as too passive with the generals and military advisers, allowing them almost free rein in Iraq, while others see him as asserting himself by forcing the retirements or reassignments of generals who disagree with his policies. Rebuffing the ISG - Many observers believe the surge is a backhanded rebuff to the Iraq Study Group (see January 10, 2007). Surge Plan Concocted at Right-Wing Think Tank - Interestingly, the surge plan itself comes largely from neoconservative planners at the American Enterprise Institute (see January 2007). A member of the Popular Front for the Liberation of Palestine (PFLP), who resides in the Nahr Al-Bard Palestinian refuge camp, tells Al Jazeera that “Fatah Al-Islam is not a legitimate Palestinian group. They are a foreign force. Whoever brought them here should take them out.” [Arutz Sheva, 3/25/2007] Shakir al-Abssi, leader of Fatah al-Islam, has denied that his group is supported by outsiders (see March 2007). However recent reports suggest that his group is benefiting from a US and Saudi policy (see Late 2006) to use Sunni groups as part of a proxy effort to undermine Shiite groups and Iranian influence in the region.